The Taylor Institution Library has mounted an exhibition (10-24 March 2017, subsequently extended to 31 March) to accompany the conference Transnational Portuguese Women Artists (Wadham College, 16-18 March 2017). The exhibition is curated by Dr Maria Luísa Coelho, Joanne Ferrari and Jessica Woodward. The exhibition catalogue is available here. The purpose of the exhibition is to highlight the significant contribution of Portuguese women artists to Portuguese culture and beyond, from the perspective of their experiences, works, contacts and, ultimately, their impact within the transnational context. It focuses on a group of women who, from the 1950s, have created a wide-ranging body of work whilst living for extended periods outside Portugal. During their time abroad, these women established relationships and collaborations not only with other expatriate Portuguese artists but also with a wider European artistic community. 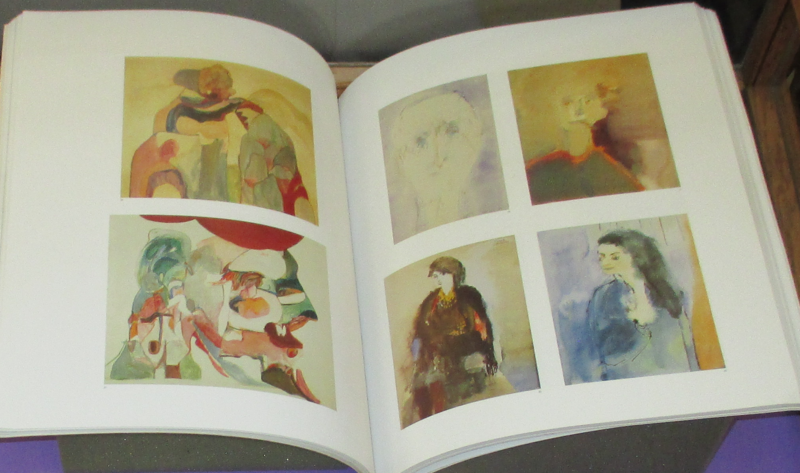 The Taylorian’s exhibition displays publications primarily held by the Taylor Institution Library, showing the artistic production of Lourdes Castro, Menez, Paula Rego, Maria Velho da Costa and Ana Hatherly. The material on view highlights the tension between the terms roots and routes while also suggesting the connections between different moments and places, and the creation of identities in transit. 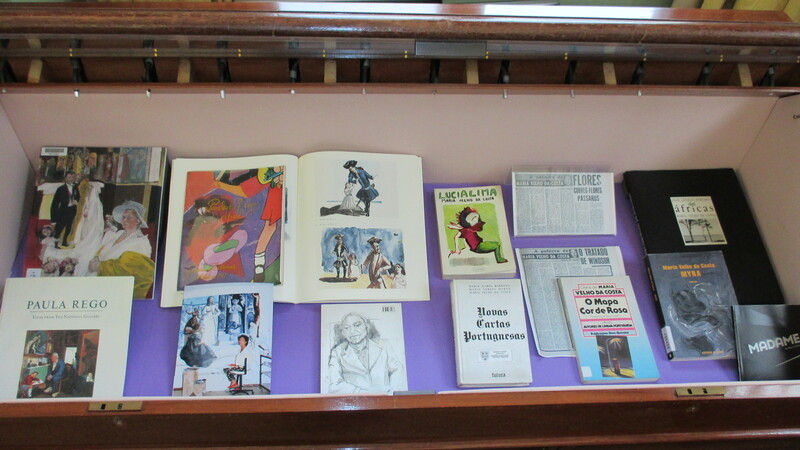 Snapshot of one exhibition case showing works by Paula Rego and Maria Velho da Costa. 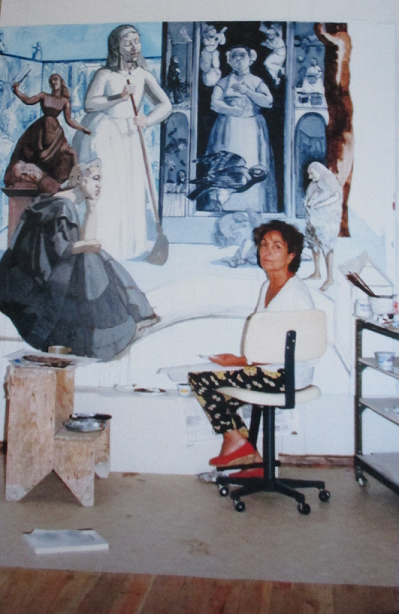 Born in Madeira, in 1930, Lourdes Castro moved to Lisbon in 1950 and, following her expulsion (for “non-conformity”) from the Escola Superior de Belas Artes, she relocated to Munich in 1957 and then Paris in 1958. There, Castro was in close contact with the celebrated couple Maria Helena Vieira da Silva and Árpád Szenes. It was in Paris, where she lived for twenty-five years, that she co-founded the experimental group KWY with her husband René Bertholo and a number of other artists. (The letters K, W and Y were considered ‘foreign’ to Portuguese by the spelling reforms of 1943.) During this period, the artist often visited London and met other Portuguese expatriates. Lourdes Castro has developed a considerable body of work focusing on the shadow, through which she reassesses the relationship between the aesthetic object and its surrounding world. In 1962 she began working on her ‘projected shadow’ works. Beginning with collaged objects these developed into paintings of Castro’s and her friends’ projected shadows. From 1966 onwards – and in collaboration with Manuel Zimbro – Castro also formed the Teatro Ambulante de Sombras (Travelling Theatre of Shadows). Despite her development of this performative art form outside of Portugal Castro’s interest in radical experimentation is clearly rooted in the Portuguese avant-garde. 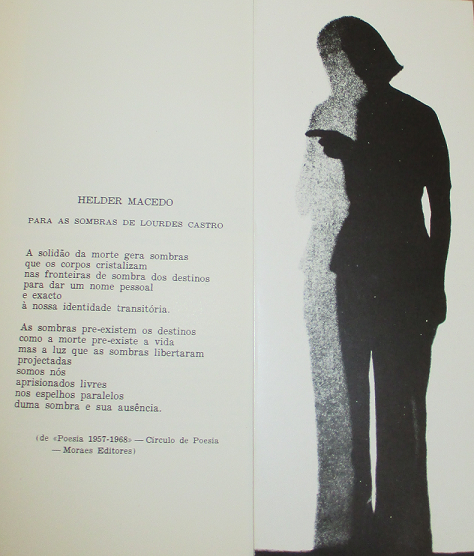 Another avenue of exploration of the shadow was the ‘inventory’, for example O Grande Herbário de Sombras (1972), (“The Great Herbarium of Shadows”, a collection of shadows of botanical specimens). This herbarium reveals Castro’s profound interest in nature, a major influencing factor in her decision to return to Madeira in 1983. Menez (1926-1995) had an exceptionally cosmopolitan existence. Although she did not undertake any formal artistic training, her travels and privileged background (which she shared, to a certain extent, with the other artists featured in this exhibition) allowed her to pursue an artistic career and overcome many of the constraints imposed on Portuguese women by the dictatorial regime of Oliveira Salazar. The artist’s first exhibition was held at Galeria de Março, Lisbon, in 1954, and showed a collection of Menez’s gouaches selected by the poet Sophia de Mello Breyner Andresen. Menez remained a close friend of Sophia and other major Portuguese writers and artists such as Maria Helena Vieira da Silva, Júlio Pomar, Mário Cesariny and António Ramos Rosa. Despite the influence of the Paris School in her early work and her debt to Vieira da Silva, Menez chose to use a grant from the Gulbenkian Foundation (1964-65 and 1969) to move to London. There, she was in contact with other cultural and aesthetic trends, and also became a central and often admired figure in the Portuguese expatriate milieu: she formed long-lasting friendships with the writers Alberto de Lacerda and Helder Macedo and the artists Victor Willing and Paula Rego. As a whole, her body of work is defined by a continuous process of change. Dame Paula Rego (1935-) was born in Lisbon. In 1951 she moved to London to study at the Slade School of Fine Art and became immersed in a lively artistic community attuned to creative activities around the world. She formed strong and close relationships with other Portuguese artists and writers living in London while never losing touch with developments back in Portugal. Rego returned to Portugal in 1957, where she lived intermittently with her husband, the British painter Victor Willing (1928-1988), and their three children. Partly prompted by the Portuguese revolution in 1974, the family returned permanently to London in 1976. Rego’s transcultural position is reflected in her work, clearly evidenced through the influence of her Portuguese heritage as well as the impact of her life in London. Through this patchwork of references, Rego addresses the recurrent themes of asymmetric power relations and gendered experiences, as she revisits the national, religious and sexual politics of the country she left behind. She is not only one of the most respected artists working in Britain today, but also a household name in Portugal. In 2009, a museum dedicated to her work –­ Casa das Histórias ­– opened in Cascais. She continues to exhibit regularly both in Portugal and in Britain. Maria Velho da Costa (1938- ) is one of Portugal’s most experimental contemporary writers, perhaps best known to an international readership as one of the authors of New Portuguese Letters (Novas cartas portuguesas, Lisbon: Estúdios Cor, 1972). Her work is imbued with a spirit of de-centering and de-territorialisation through the creation of diverse characters, worlds, realities and dimensions that nevertheless coexist or intersect. Through continually pushing the boundaries of literary genres, she explores the possibilities of language in dialogue with other artistic media such as music and the visual arts. This de-centering process is also a reflection of the locations she has chosen to spend time in: she was briefly in Guinea-Bissau in 1973; in 1980 she moved to London, where she worked for about six years as Portuguese leitora at King’s College; after that she was appointed cultural attaché in Cape Verde (1988-89). 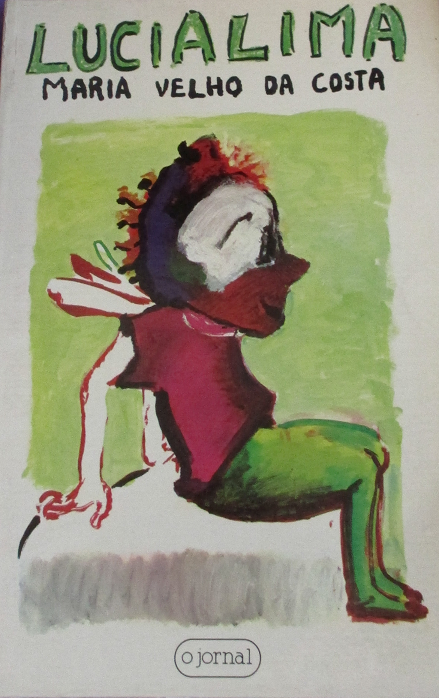 During her time in England Velho da Costa wrote and published the novel Lúcialima (1983) whose cover was illustrated by Paula Rego; and the compilation O Mapa Cor de Rosa: Cartas de Londres (1984), about life in London in the early 1980s. More recent works, such as Madame (2000) and Myra (2008) continue to display physical or psychological accounts marked by an interest in otherness and the intersecting of different worlds, realities and languages; they also show her collaborations with visual artists. Ana Hatherly (1929-2015) was born in Porto, moving to Lisbon at an early age. After undertaking formal musical training in Portugal, France and Germany, she took a degree in Modern Languages at the University of Lisbon. She then enrolled at the London International Film School (1971-74) and subsequently moved to the United States where she completed a doctorate in Golden Age Hispanic Literature at the University of California, Berkeley. A clear focus of Hatherly’s oeuvre is the relationship between word and image, already evident in her early works, produced while living in London. 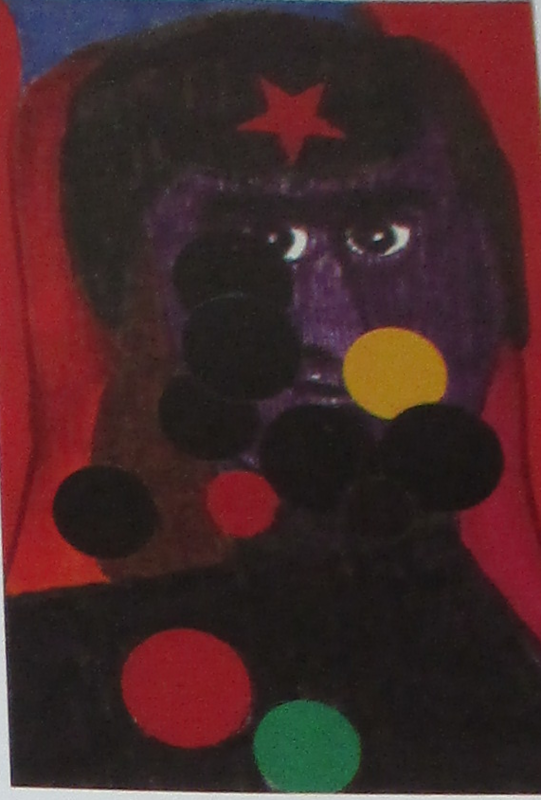 Her output from this period also exhibits the influence of Pop Art, a strong connection with the concrete-experimental movement, and her adoption of the collage technique. The artist’s visual exploration of text evolved into her visual poems, informed by her academic research on baroque poetry. In 1959 she began experimenting with concrete poetry. She soon became one of the leading figures in the Portuguese Experimental Poetry group, regularly contributing to avant-garde journals, edited collections and group exhibitions in Portugal and abroad. You can also see two videos of Maria Luísa and Luis Amorim de Sousa introducing and discussing the exhibition (links below, courtesy of Prof. Henrike Laehnemann). This entry was posted in Collections and tagged Ana Hatherly, artists, exhibitions, identity, Lourdes Castro, Maria Velho da Costa, Menez, Paula Rego, Portugal, transnational, women, writers on 30 March 2017 by ferrarij.